Why am I being prompted to download my game a second time? What is this referral button? I'm missing a charter shiny! I found a game that is inappropriate or isn't working! How can I report it? How do Kartridge chat rooms work? How does the New User Quest work? 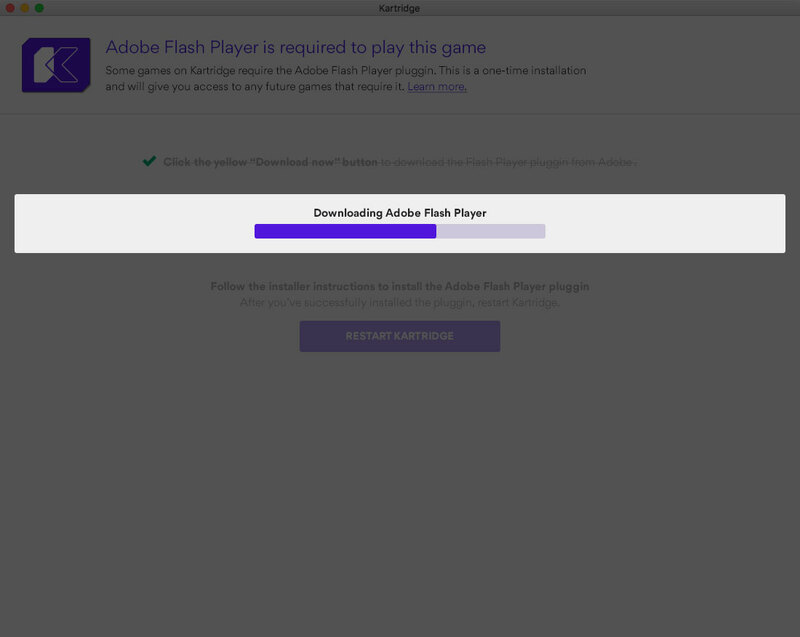 Some games on Kartridge require Adobe’s Flash Player plugin in order to be played. Unfortunately this plugin needs to be installed manually. 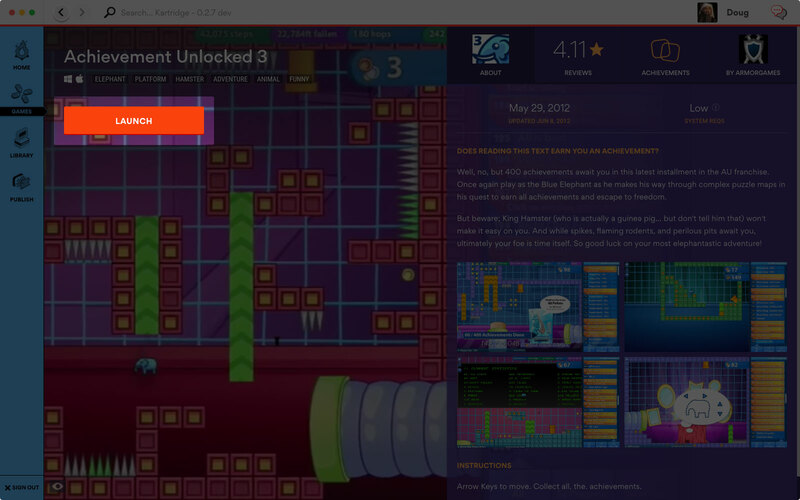 This is a one-time installation and will allow you to play any other game on Kartridge that needs the plugin. YOU WILL NEED TO PERFORM THIS INSTALLATION IF PROMPTED, EVEN IF YOU HAVE UPDATED FLASH VIA OTHER MEANS. IMPORTANT: If you currently have Firefox set up as your default browser, consider changing it to Chrome, Edge or Safari for the duration of this troubleshooting. NOTE to Windows Users: Before restarting Kartridge, check your system tray for applications running in the background. If the Kartridge Icon is there, right click on it to close the program. Adobe might also suggest bundling antivirus or other software with your download. This is totally optional and you’re safe to disable those options before you download the installer. 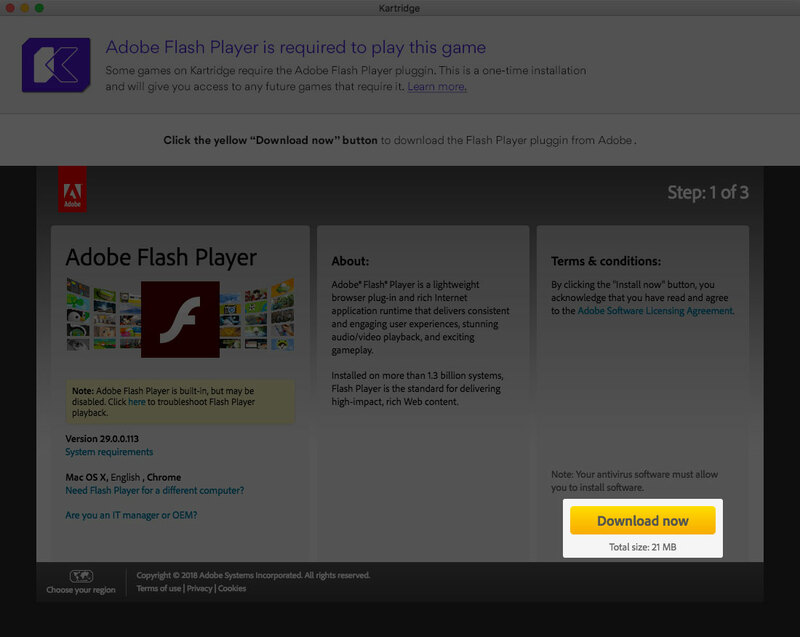 The Flash Player installer should immediately launch when the download is finished. If it doesn’t please run the installer and follow its instructions. Not sure where it downloaded to? Most likely it went to your downloads folder. You can also search your computer for a file named “flash player”. 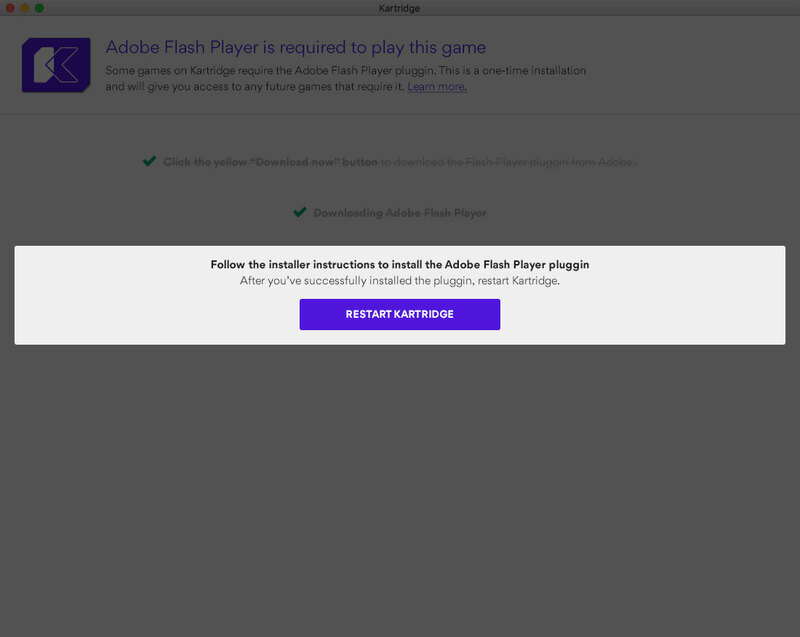 After Adobe’s Flash Player Plugin installer has completed you’ll need to restart Kartridge to finish the installation process. Don’t worry, it’ll bring you right back to your game. STEP 6: ENJOY YOUR GAME! You should now be ready to play your game. You’ll never be prompted to go through this flow again. Have fun! If you have any troubles with this process, please contact support@kartridge.com. I accidentally purchased a game! How do I get a refund?